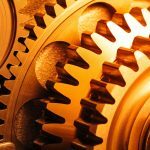 Coatings, surface finishes, lubrication, geometry, all these factors and more affect the efficiency of a gear drive system. Klingelnberg provides a list of points to consider. 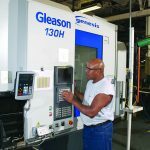 The potential for improving the efficiency of final drives by systematically employing special lubricants has been exhausted. 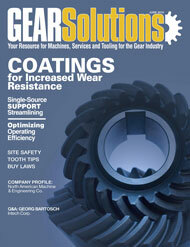 For pointed gears the focus is now primarily on seals, bearings, and gear design. 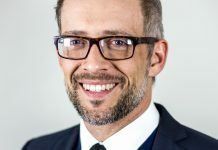 Since the opening of public discussion about minimum CO2 emissions there have been competing power concepts, sometimes leading to curious technical solutions. Interestingly, the CO2 budget of a modern internal combustion engine is superior to that of a car powered purely by electricity, if the entire chain from the power station to the electric motor is taken into consideration. Hybrid power has a better energy budget only if kinetic braking energy is converted not into heat but into electrical energy, which can later be used for acceleration. Irrespective of possible preferences for different power concepts, however, one task will always be to minimize losses in the power train. The influencing variables for the efficiency of a final drive, depicted in Figure 1, include losses in seals and bearings, losses due to the lubricant and to meshing and, in addition, losses which alter the above variables as a result of operating conditions. Efficiency is defined as the ratio of power output to power input. The η symbol is generally used. The difference between power input and power output is the total power loss, designated as PV. • Load-independent idling power loss. • Power loss in subassemblies, e.g. oil pumps. Given this classification into different components of power loss in a final drive, it is possible to examine in detail the mechanisms of action and the influencing variables. Various seal designs are used, depending on the installed situation of the drive. On the one hand the seal must reliably and sustainably prevent contamination from penetrating the unit. On the other hand, there must be no loss of lubricant through the bearing. The two types mainly employed are labyrinth glands and radial shaft lip seals. The type of seal often used in rail drives is the labyrinth gland or box. It is a contactless shaft seal that relies for its effect on long sealing slits. Rings on the shaft alternate with barriers on the fixed part of the housing. The rings are partly designed as slinger rings, so that the lubricant is spun outward by means of centrifugal force and diverted into a feedback channel by the barrier. A labyrinth gland is maintenance- and wear-free and has practically no power loss. Because the contactless design provides no absolute seal, it can be used only for specific applications. It should be noted that the lubricant level must always remain below the seal when the drive is at a standstill. This imposes certain requirements on the housing design and the field of applications. Rail drives are often fitted with labyrinth seals. Unlike road vehicles, trains do not tilt to any great extent, so that the oil volume in the housing is only slightly displaced. Road vehicle final drives are usually fitted with radial shaft lip seals. 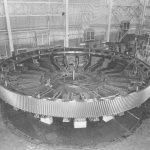 These are firmly seated in the housing, with the lip running on the surface of the rotating shaft, and is usually pressed radially on to the shaft surface by a coil spring. Unlike a labyrinth gland, a shaft lip seal assures virtually perfect sealing. 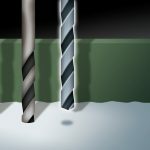 In order to ensure this, the surface of the shaft must meet tight specifications. As far as efficiency is concerned, a slight friction of the sealing lip, which also prolongs service life, is necessary. Special materials made of fluorocarbon rubber exhibit favorable wear behavior and are also resistant to the lubricants employed. 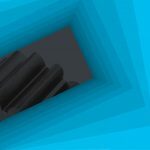 The shaft surface must also be as smooth as possible, to prevent any oil transport through the seal of the kind that occurs on turned surfaces due to grooving structures. In drives that only have a single direction of rotation, a twist surface below the sealing lip may be advantageous, as it returns leaked oil to the unit. Unlike labyrinth glands, radial shaft lip seals suffer losses independent of load. The parameters governing the amount of loss are the speed of rotation, the conditions of sliding friction between the sealing lip and the shaft and the contact pressure of the sealing lip. Contact pressure, and hence wear, can be reduced by using a number of radial shaft lip seals. 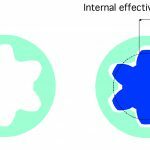 Overall, a good engineering design of the sealing point can increase both efficiency and service life. 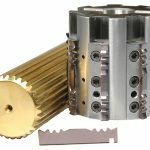 The bearings of a gear system are responsible for holding the components in position, absorbing and distributing forces and moments, and assuring the rotation of shafts and gears. These requirements can all be satisfied through high stiffness in the axial and radial directions, for which reason tapered roller bearings are employed. By comparison with ball bearings, these require much less space and a smaller bearing distance for the same load capacity and stiffness. With tapered roller bearings, two opposed bearings are always used. 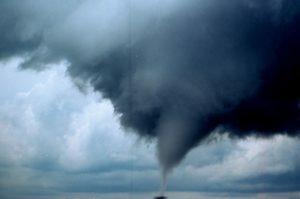 The rolling bodies take the form of a truncated cone. They are tilted in relation to the rolling axis in such a way that the cone axes of the outer and inner rings and the axis of the rolling bodies intersect at a point on the axis of rotation. This enables the tapered rollers to roll without sliding, so that only rolling friction occurs. The bearing clearance is adjusted by axial preloading of an inner or outer ring. This preloads the rolling bodies and bushings and achieves a stiff, play-free radial and axial support bearing. Past research has shown that a stiff radial-axial bearing has a positive effect on the total efficiency of a final drive. 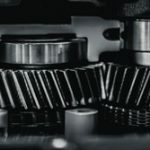 This statement remains true as long as one assumes that meshing conditions would deteriorate significantly if a fixed/movable bearing were used, due to load-induced displacement in the gear unit. 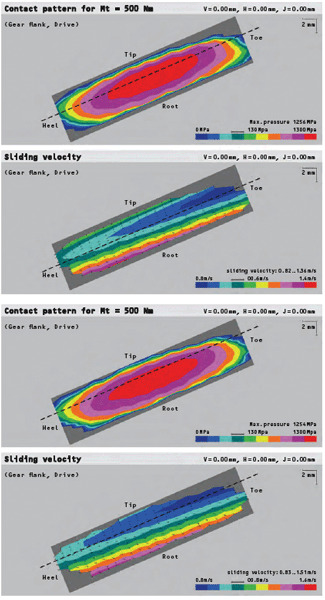 If, however, the meshing parameters are optimized for situations of this nature, there is no correlation between bearing stiffness and the efficiency of the final drive. It is rather the case that bearing-typical frictional losses then become the dominant factor. Preloading produces sliding friction between the faces of the tapered roller bearings and the bearing ring collar. The magnitude of the power loss due to this collar friction depends on the speed of rotation and the level of preloading, and therefore possesses a load-dependent and a load-independent component. A ball bearing has smaller friction losses than a tapered roller bearing but also, unfortunately, much lower stiffnesses. A number of angular ball bearings are required to absorb higher axial and radial forces. The pressure angles are roughly 35 degrees. In a different bearing design, the races are shaped in such a way that a ball in each case has two points of contact on the inner and two on the outer ring. This version is known as a four-point bearing and can be loaded more heavily in both the axial and radial directions than an angular ball bearing. 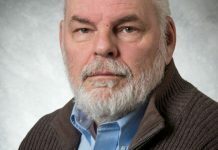 Idling losses are significantly lower than for tapered roller bearings, but an angular ball bearing of the same size has significantly less load capacity. Although a number of factors favor the use of angular ball bearings from the viewpoint of efficiency, the intended application should always be decisive. The collective load on an automotive final drive has many fewer high load peaks than that of a heavy-duty utility vehicle. As soon as the high-torque/low-speed component becomes larger a tapered roller bearing should be preferred, since the power loss of the bearing is very low in relation to the power input. 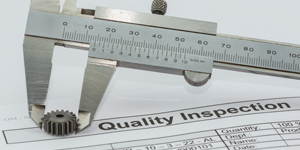 A tapered roller bearing is also much less sensitive to contamination. Owing to its very small contact surface, an angular ball bearing reacts very sensitively to even the slightest contamination of the lubricant, for example by lapping abrasive. 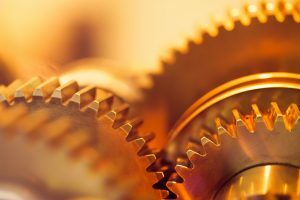 A gear lubricant reduces friction and wear and protects the elements of the gear against corrosion. In addition, it dissipates the heat generated by power loss to the housing and hence to the surroundings. 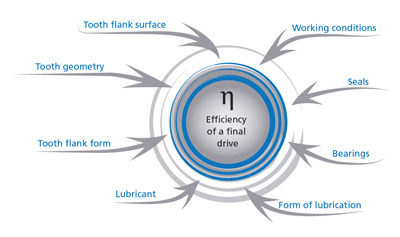 Final drive lubricants are mainly synthetic-based oils. The good aging stability of synthetic as opposed to mineral oils is supported by low contact friction. This in turn results in lower oil temperatures and hence in lower thermal stressing. There is, however, no simple correlation between oil temperature and meshing efficiency. On the one hand, a higher oil temperature leads to lower viscosity and lower idling losses. 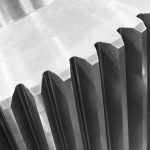 On still another hand, a limit is set to reductions in viscosity by the need to protect gear teeth against such forms of damage as wear, scuffing, micro-pitting, and pitting. The higher the load and the lower the circumferential speed the higher the viscosity should be, in order to provide reliable protection against gear damage. Higher viscosity causes higher idling losses, however. Apart from the lubricant, the form of lubrication decisively affects efficiency. With the generally used splash lubrication, the wheel runs in an oil sump. Depending on its depth of immersion, as measured with the gear at a standstill, the idling power loss varies due to splashing losses. In practice, the immersion depth is roughly one and a half times the face width. The selected immersion depth may vary depending on the size of the gear housing and the maximum speed of rotation. A large immersion depth results in better heat transfer from the tooth flanks to the oil. At the same time, the speed dependent idling power loss due to lubricant splashing increases. An inadequate immersion depth causes overheating of the tooth flanks and hence scuffing damage, as the cooling effect of the lubricant is too slight. Losses from the teeth are caused by friction between the meshing tooth flanks. The tooth friction power loss PVZ is the product of the coefficient of friction µ, the normal force FN, and the sliding speeds Vgα and Vgß. These factors are not constants, but locally differing variables. Strictly speaking, the tooth friction loss must be calculated as the integral of the local product over the entire tooth flank, described by the parameters x and y. The mathematical formula indicates the basic interrelationship. Unfortunately, the variables are not mutually independent, since in hydrodynamic contact, for example, the coefficient of friction also depends on the sliding speed and the normal force. This equation cannot, therefore, be solved without simplifying assumptions. The coefficient of friction µ depends on the lubrication, the surface topography of the tooth flanks and the sliding speed. Since tooth contact is hydrodynamic, not only the viscosity but also the sliding speed and the curvature affect the coefficient of friction. The normal force FN results from the load distribution on the flank. It is determined by the design of the ease-off, by the contact ratio, and by the transmitted torque. The sliding speed Vgα is given by the profile displacement Vgß divided by the offset. Both components depend additionally on the speed of rotation of the drive. 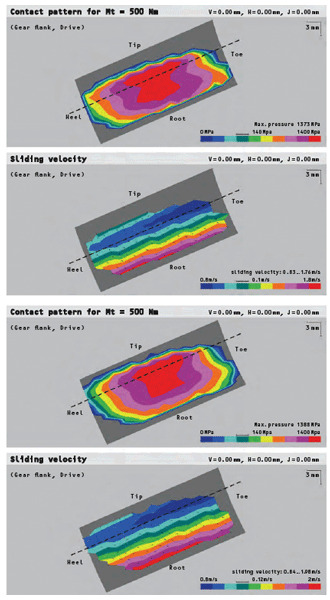 The influencing variables for meshing efficiency may be divided into the three following categories: tooth geometry, operating conditions, and lubricant parameters. The main influence comes from the tooth geometry. The greater the offset, the higher the sliding speed Vgα in the tooth lengthwise direction. The profile displacement influences the sliding speed Vgß in the profile direction. 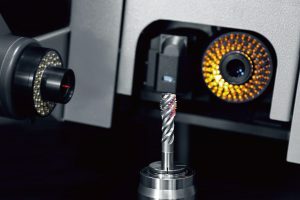 To improve efficiency it is advisable to keep both variables as low as possible, remembering that the selected profile displacement must guarantee freedom from undercut and that pointed tooth tips on the pinion must be avoided. A similar statement may be made for roughness on the tooth flank. It must be kept as low as possible, so that hydrodynamic flank contact is preserved even at low rotational speeds and correspondingly low lubricating film thicknesses. The following sections take a closer look at two sample gears, with two different profile displacements in each case. The gear data are selected to ensure that the sole differences are in the module and the profile displacements. The results of analysis of these four gears (Table 1) will be used to explain the mechanisms of action of the parameters. Gears A and B differ in their modules; the transmission ratios are identical. Figure 3 shows the two gear types A and B. A0 and A03 additionally differ only in their profile displacement, in line with B0 and B03. Figure 4 shows the pressure distribution and sliding speed for the two variants A0 and A03 at an input torque of 500 Nm and an input rotational speed of 1000 1/min. 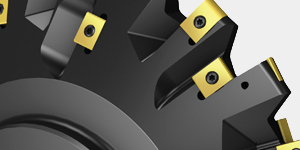 As a result of the profile displacement, the position of the pitch cone—which is indicated as a dashed line—has moved closer to the wheel tooth tip so that, given an otherwise approximately equal pressure distribution, a difference in meshing efficiency is bound to occur. In this position of the load contact pattern, a calculated meshing efficiency of 97.20 percent for A0 and 97.26 percent for A03 does in fact appear. Examining the middle load contact pattern, all the lowest sliding speeds in A0—namely those on the pitch cone—are found in the zone with the highest pressures, while on A03 they are in the regions with higher sliding speeds. The deterioration in efficiency can be explained in this way. This effect is especially marked on gears with large profile heights. Figure 5 shows the same content for gears B0 and B03. As expected the calculated efficiency for B03 is clearly lower, with 96.86 percent for B0 and 96.95 percent for B03. The significantly poorer efficiency level for the B types is due to the lower contact ratio and the larger curvatures. Owing to the large module the gear has large teeth, but significantly fewer tooth pairs simultaneously in contact. Moreover, the curvatures increase. These two effects lead jointly to a higher pressure at the same load and explain the loss of efficiency between variants A and B. A vital point not considered in the classic standards is the face width. A large face width often allows crowning to be reduced, resulting in a lower pressure level. This effect causes efficiency to rise with increasing face width, provided that insensitivity of tooth contact to load-induced displacements can be assured. 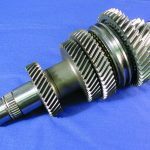 Leaving aside the gear geometry variables, operating conditions like the speed of rotation and lubricant temperature are the parameters with the next greatest influence. As speed increases, the lubricant film becomes thicker and the coefficient of friction approaches the theoretical minimum determined by the Stribeck curve. Meshing efficiency improves as a result. From a certain point onward the increase in splashing losses is greater than the decrease in frictional losses on the tooth flanks. The only remedy here is injection lubrication, provided the necessary oil pump power is low enough. Heat dissipation from the gear is much slighter with this form of lubrication, and the higher mass temperature produces a drop in lubricant viscosity. Unfortunately, the resulting thinner lubricating film then reduces meshing efficiency. The lubricant parameters that influence efficiency are temperature and viscosity. Viscosity determines load-free idling losses, which are caused by displacement and squeezing of the oil during tooth engagement. 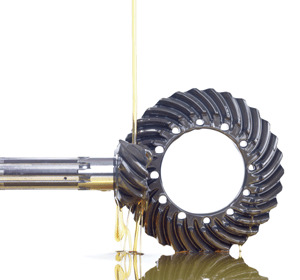 A low-viscosity lubricant is therefore better for low idling losses than a high-viscosity oil. This applies only to EHD contact, however, in which the tooth flanks are separated by the lubricating film. 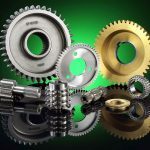 If load states are lower, leading to metallic contact of the tooth flanks, a higher viscosity lubricant needs to be used as a matter of urgency in order to prevent scuffing of the gear. 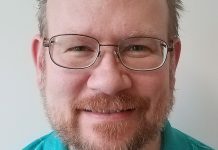 Isolated efficiency optimization is not useful. 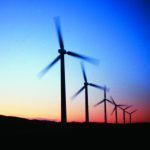 The aim must be to optimize the entire final drive system so that the required power can be transmitted with as little noise and as much energy efficiency as possible within the required operating time. The mechanisms presented here for the individual loss components demand a suitable compromise which, according to the following recommendations, may be different in each application. 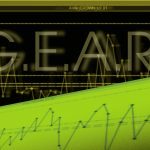 The gear geometry parameters have the greatest influence. A small-module gear invariably possesses greater efficiency owing to its high contact ratio, lower curvature, and lower profile height. One should not forget that root load capacity sinks significantly as the module becomes smaller. 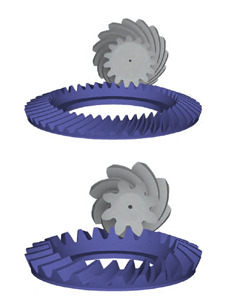 At the same torque, the two sample gears A and B differ by 40 percent in terms of their maximum tooth root stresses. Face width likewise exerts a positive influence on efficiency, since efficiency increases as pressure falls. It should be noted that the ease-off must be designed in such a way that the available face width can also really be used for tooth contact. 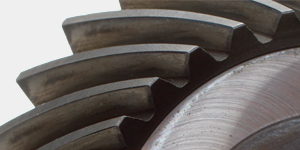 To obtain an efficiency-optimized gear, the offset must be kept as small as possible. In final drives this has a negative effect on load capacity since the pinion becomes larger as the offset rises, increasing resistance to tooth breakage. The next group of influencing parameters is concerned with the surface topography of the tooth flanks. 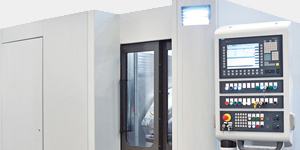 The lower the surface roughness, the higher the efficiency will be. 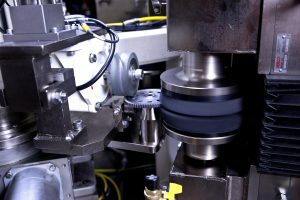 Coating the flanks with low-friction films will play a more substantial role in the future, provided the coatings survive throughout the operational life of the drive. The very different moduli of elasticity of the coating and the steel demand highly effective coating-substrate adhesion, since otherwise the hard film on the tooth behaves like an eggshell on a boiled egg. 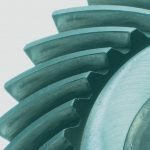 The phosphate coatings used up to now serve largely to protect the gear against corrosion and running-in, and less to reduce the coefficient of friction. Potentials for reducing friction via the lubricant are steadily fewer. Synthetic oils with appropriate additives allow us to combine lower viscosity with high scuffing resistance. This means that idling losses of the lubricant can be kept low without endangering the functions of the drive. Finally, there are the engineering design options for the final drive. If a labyrinth seal is feasible, idling power losses in the bearings can be reduced significantly. 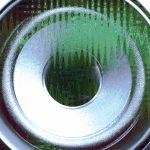 If a radial shaft lip seal is essential, the only recourse is a smooth shaft surface at the bearing point, to restrict frictional power at the sealing lip to a minimum. 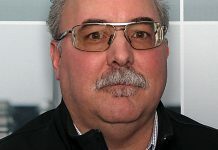 Low-friction bearings will be relevant in the future. Since they always involve sacrifices in stiffness, however, gear designers will be asked to make larger load-induced displacements possible by means of intelligent tooth flank modifications while at the same time minimizing load dependent meshing power losses and noise emissions.